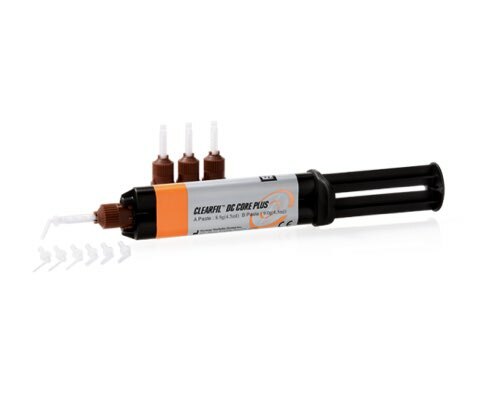 CLEARFIL DC CORE PLUS is a dual-cure, radiopaque two-component core build-up material supplied in a convenient automix delivery system. CLEARFIL DC CORE PLUS has superior compressive and flexural strength with a filler loading of 74wt%. CLEARFIL DC CORE PLUS cuts like dentin when being prepared, and affords long-term durability. Core build-ups are faster, easier and stronger than ever when used with our one-step bonding agent: CLEARFIL Universal Bond Quick, also offering the added benefits of fluoride release and greatly reduces postoperative sensitivity. CLEARFIL DC CORE PLUS provides the dentist with the confidence of durable, lasting restorations. Which bonding agent is recommended for use with DC CORE PLUS? Can a dual-cure adhesive be used with DC CORE PLUS? Click here for additional CLEARFIL DC CORE PLUS FAQs. 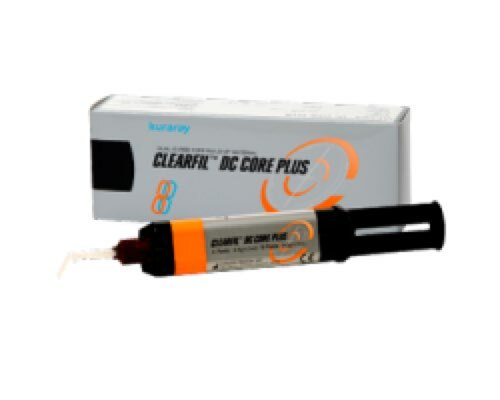 View cart “CLEARFIL DC Core Plus: Dentin 2942KA” has been added to your cart.